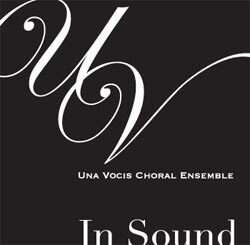 In Sound is the debut recording of Una Vocis Choral Ensemble. For years our concert audience members have encouraged us to produce a CD. This is the answer to those urgings. In Sound is a compilation of some of our favorite selections from 2008, 2009 and 2011. Nearly every year after our spring concert, we have a couple days of recording sessions to capture the essence of the music we worked on for the previous few months. This CD is the fruits of those fun labors. All recordings were done in Holy Family Catholic Church in Mason City, Iowa. Tracks 7 and 8 are from 2008, tracks 3, 4, 11 and 12 are from 2009 and the balance are from 2011.